This time last year I reported on an innovative new venture between churches and the NHS. 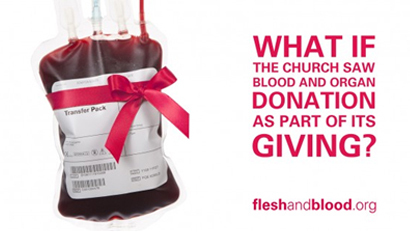 Given the name fleshandblood, the campaign, which is backed by most of the largest church denominations, aims to raise the profile of blood and organ donation in churches and encourage blood and organ donation as a personal gift. It seeks to equip individual Christians and churches to be advocates for donation, helping them to engage with their family, friends and community. Fleshandblood is now halfway through its two-year program. In the last year thousands of donors have signed up as a result. At Greenbelt alone over 800 festival goers flooded to sign up at a rate of one registration every two minutes. Rowan Williams also wrote a poem on behalf of the campaign for the occasion. of the eligible population over the last two years. 28 per cent consider blood and organ donation to be part of their giving. A further 42 per cent had not considered it, but were open to the idea. Despite this considerably supportive attitude, such donation is rarely mentioned in churches according to those surveyed. In response the campaign last week launched a new challenge to churches across the UK to become “Donor Churches”. The fab Church Challenge is the first of its kind and seeks to encourage churches to talk about blood and organ donation as part of their giving. Around three people die per day due to the shortage of organs in the UK. Fleshandblood intends to inspire Christians to see giving as more than just money and meet a real and practical need in a simple and effective way. Some churches have offered their buildings to the NHS as blood donation venues. This too is a chance for churches to be focal points within their communities and share their resources with those around them. If this is something you wish to consider further either as an individual or as a church, there is all the information needed at the fleshandblood website. There is also a very informative report on last week’s Radio 4 Sunday programme on the subject. Article starts at 18.05 minutes. ‹ Isn’t it time we stopped pretending that all religions are equal? Its probably just a desire to blow a trumpet or two, but in preparation for Hope08 (I was the national coordinator) I approached the NBS and we agreed that there would be a blood donation element within the material circulated to churches and Christians. The impact on a few locations where Churches did respond wholeheartedly was to close down open sessions due to the numbers taking part. We also discussed a way of monitoring the donations so that the NBS could measure the impact of the new donors. The imagery between the blood of Christ and us donating our blood to save the lives of others is compelling. I am thrilled that flesh and blood has been able to take this idea much further. The great thing about giving blood is that for 15 minutes or so, there is the chance to speak to phlebotomists about the reason why we are giving blood. Thanks for sharing this Ian. This is great to hear.